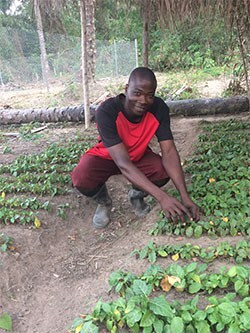 The World Vegetable Center (WorldVeg) is pleased to announce it has received two grants from Germany’s Federal Ministry for Economic Cooperation and Development (BMZ) to support vegetable research and development activities in Tanzania and Kenya. By grafting tomato on wild eggplant rootstocks, farmers can avoid bacterial wilt and root knot nematode problems. In India there are now many commercial vegetable nurseries producing grafted seedlings, but high prices prevent small and marginal farmers from purchasing the seedlings. Conducted under the SNV-led CHAIN project funded by the Swiss Development Corporation (SDC), the workshop brought together 45 participants (10 women & 35 men) to learn how to graft tomato and when to apply the method. Grafting peppers can minimize problems caused by flooding and soil-borne diseases. Learn this simple yet effective technique to improve your pepper harvest. Grafting tomato onto hardy tomato or eggplant rootstocks can minimize problems caused by flooding, soil-borne diseases, and root-knot nematode. Watch as staff from AVRDC - The World Vegetable Center demonstrate this simple, effective technique. Grafting cucurbits on to disease-resistant rootstocks can help farmers and gardeners avoid problems with Fusarium wilt. A contract farmer in Indonesia discovers grafting, a simple but effective technique introduced by AVRDC to overcome soil-borne diseases in tomato fields.